Prevent Initial trouble! 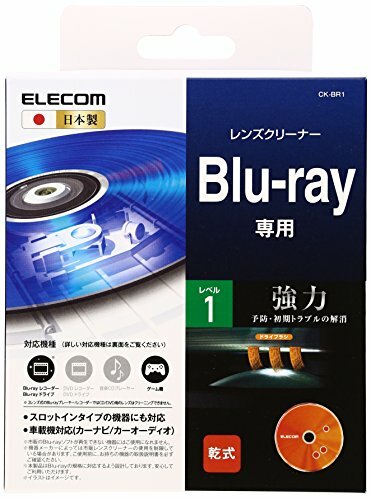 Blu-ray exclusive lens cleaner corresponds to the whole Blu-ray device in general, it can also be used in PLAYSTATION 3 The surface of the lens can be cleaned firmly. ELECOM Co., Ltd. is a Japanese electronics company, headquartered in Osaka, Japan. They are best known for their modern design, especially with their mice. The company produces many electronics along with other Japanese computer-peripheral manufacturers such as I-O Data, Buffalo, and Century micro that are shipped to many outside and larger companies, as an OEM (e.g. Century Micro is known to ship their memory chips to Samsung.) In recent years, its business has been expanded into new areas, including: supplies of tablet PCs and smartphones, health care products such as body composition scales and electric therapy equipment, and the digital home area, with an enhanced development of network products such as wireless LAN routers, a cloud service and an installation service for wireless LAN access points. The ELECOM group sets out to create new markets by aiming for the new comfortable space of smart home realizing product development and sales with the concept of a "Human interface: Connecting users to devices with more comfortable and better usability." [A wide range of product categories] Smartphones & related items, Smartphones, Healthcare products, Healthcare Applications, Tablet PCs & related items, VR products, Wearable products, LED lighting & related items, Lifestyle & related items, Digital TVs & related areas, Game consoles, Memory, Furniture, Storage, Networks, Accessories, IO devices, Consumable goods, Digital cameras, Music distribution devices, On-board equipment, Wireless LANs. If you have any questions about this product by Elecom, contact us by completing and submitting the form below. If you are looking for a specif part number, please include it with your message.